Thermoplastic composites are manufactured using a thermoplastic polymer matrix reinforced with glass, carbon, aramid or metal fibers. Thermoplastic polymers are long-chain polymers that can be either amorphous or semi-crystalline in structure. These long-chain, medium-to-high molecular weight polymers make thermoplastics that are tough, resist chemical attack, and have a long shelf life. But more importantly, thermoplastics are recyclable and emit little to no VOC’s, giving them significant environmental advantages over traditional thermosets. Crown Composites’ unique manufacturing advantage is its ability to create composite materials via long, continuous compression runs at high temperatures and pressures. 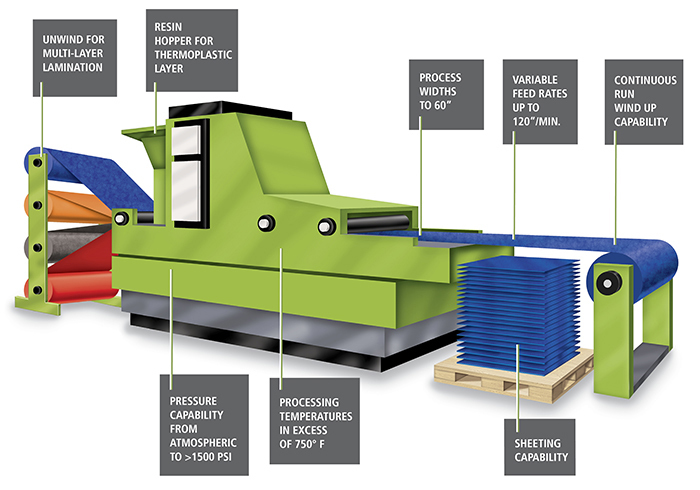 With processing widths up to 60 inches, Crown Composites’ production system is capable of handling both small-scale and full-width prototypes – all within the same system!